Case Logic Laptop Sleeve for 13" Chromebook or Laptops, 14 1/4 x 1 7/8 x 11, Black. 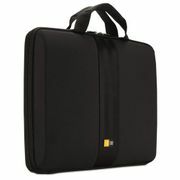 The sleek shape of this molded EVA case provides slimline protection for laptops without sacrificing style or design. Clamshell design and integrated airflow channels allow you to use your laptop while still in the sleeve without the risk of overheating. Thick, quilted padding keeps your device protected and snugly in place to prevent it from sliding around. Padded carry handles for comfortable transportation.